Back in September 2017, the IMO reached a major milestone in modern maritime history: Its long-awaited Ballast Water Management (BWM) Convention finally came into force. This international treaty will have a profound impact on the industry for years to come. Get the answers to key ballast water questions in this FAQ. Why does ballast water have to be treated? Many vessels take on ballast water to improve balance, stability, and structural integrity when they are sailing without cargo, for example. When the vessel is loaded, the ballast tanks are then emptied—and this is where problems can arise. As ballast water is taken on, thousands of organisms living in that water are brought on board. Many of these can survive the journeys taken by ships and consequently are released into ecosystems where they are not native when the ship reaches its destination. A famous case is that of the comb jellyfish (Mnemiopsis leidyi), which migrated from North America to the Black Sea via ballast water tanks. With no natural predators, the comb jelly quickly spread, depleting native populations of algae and fish such as anchovies. Untreated ballast water can also have devastating consequences for humans, too. An outbreak of cholera in Peru in 1991 that killed 12,000 people has been attributed to bacteria transported in ballast water. What rules apply to ballast water treatment and management? The BWM Convention applies to all ships using ballast water in international trade. There are two different standards: regulation D-1 and regulation D-2. The implementation timetable is phased and is linked to the ship’s International Oil Pollution Prevention Certificate (IOPPC). At present, existing ships have to comply with at least D-1, which requires vessels to exchange their ballast water in open seas (at least 200 nautical miles from land and in water at least 200 m deep). If that is not possible, then discharge must be at least 50 nautical miles from the nearest coast in water at least 200 m deep. 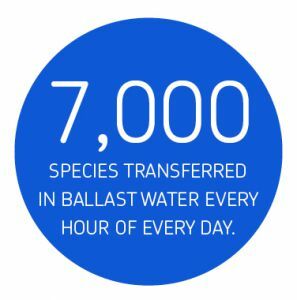 New builds have to comply with the D-2 standard, which necessitates the installation of a type-approved ballast water management system to remove, sterilize or kill organisms before discharge. By 2024, all ships will have to comply with D-2. Watch this video from the IMO to get a clear overview of the compliance timeline. less than 100 cfu per 100 milliliters of Intestinal Enterococci. Why are there stricter rules in the US and what are the key differences? The US is not a signatory to the BWM Convention. However, the country has its own stricter federal regulations enforced by the US Coast Guard (USCG). As with the IMO regulation, all vessels operating in US waters are required to follow a ballast water management plan that is “specific to the vessel” and details how the ship will comply with the regulations. But a key difference is that the US rules currently reject treatment methods that merely sterilize organisms rather than killing them outright. What alternative methods are allowed? Where space is available, some ports may have large-scale shore-based ballast water treatment facilities. These enable better control of treatment, regular monitoring by port authorities, and environmentally friendly disposal of waste. However, one of the main drawbacks of land-based treatment is the risk of delays if the total ballast capacity of ships exceeded that of the treatment plant. While shore-based treatment avoids capital expenditure and maintenance costs associated with an on-board BWMS, availability can be an issue as not every port has facilities for ballast water treatment. What documentation is required to achieve compliance? All ships require an approved ballast water management plan, a ballast water record book, and an International Ballast Water Management Certificate. The plan should include duties of on-board personnel for carrying out ballast water operations, an operational procedure for the ballasting method, and a definition of the treatment method and sampling points. These documents will be verified during port state control inspections. The BWM Convention and USCG rules and regulations will continue to be an important issue for the next five years at least, as shipowners, shipyards, and ship operators attempt to find and implement compliant solutions. With this in mind, Engineering at Sea is dedicating a part of our website to related topics. Keep an eye out for our “In focus” articles to get more information about ballast water regulations, treatment methods and technologies, and important updates and news. Subscribe for updates and make sure you don’t miss out.